Remember, remember the 5th of November? 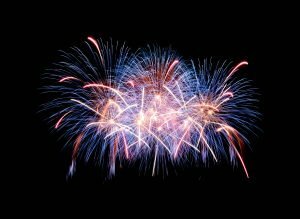 While a firework display can be magical time for the family , there are safety precautions you need to take. Your little one’s ears are super sensitive and the noise of the fireworks will probably be the loudest noise they have ever heard. 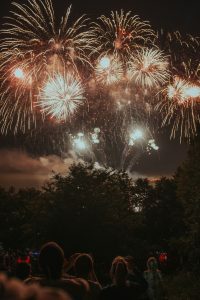 If the fireworks are being set of in a small place such as a garden, maybe watch the fireworks inside and stay in the warmth and watch from the window. If you’re watching a public display then keep your baby’s ears protected with a pair of ear muffs, baby ear plugs, which are easy – and safe – to insert into your baby’s ears or even Ear Defenders. 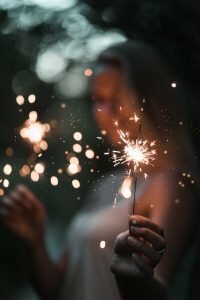 Sparklers are a great way to enjoy the Bonfire weekend, particularly for children who can use them to write their names in the sky and make pretty patterns. But, it’s worth remembering whilst sparklers may look harmless they can cause serious injury if they are not handled correctly. In fact, a single sparkler can reach a temperature of up to 2,000⁰C, which is 15 times the boiling point of water, and 3 sparklers lit at once will burn at the same heat as a blowtorch used for joining metal. But this doesn’t mean you shouldn’t have them at your display. Instead, follow the advice below and you’ll ensure sparkler safety. If you do decide to give your child a sparkler, always help them and hold it away from their face, clothing and hair and make sure they are wearing gloves to protect her hands. Something that you may consider which sounds daft but works quite well, is too stick the sparkler in the end of a long carrot. That way the carrot its like an arm extender and the little 1 doesn’t actually touch the sparkler handle. Once the sparkler has finished, place it in a bucket of cold water. At public displays, there is usually a safety barrier that you should stay behind and if you’re in a private garden then keep as far away as possible from where the fireworks are set off. You should always only buy Fireworks with the BS7114 Kitemark. Never buy a box that has been tampered with. Don’t condiser buying cheap fireworks from the man down the pub! Fireworks can kill , something you shouldn’t really mess around with. It is important to always read the instructions for each firework. Light all fireworks from arm’s length and use a touch to lighting not a flame. Even if the firework hasn’t gone off, it can still explode. Never throw discarded fireworks onto bonfires as they may still have gunpowder left in them. Put all discarded fireworks into a bucket of water. Never let children near a lit firework. When building your bonfire always ensure your fire is built in an open space and that you are not in a smoke free area. Do not build your bonfire close to hedges, fences, sheds or building. Fire spreads quickly it is important that the area around your bonfire is clear. Have you considered visiting a local bonfire event instead? And don’t forget to check the bonfire for wildlife if you’ve built it a few days before. Before lighting your bonfire all check that there are no animals hiding within the structure for warmth. Hedgehogs in particular like climbing inside unlit bonfires. Keep your pets indoors if they do not like loud noises try leaving the radio or television on for them. Don’t forget your neighbours pets too, a quick knock on a neighbours to let them know about your plans allows them the chance to bring their pets indoors if necessary. Never light a bonfire with flammable liquid. Instead use domestic firelighters and never throw aerosol cans or tyres onto a fire. Don’t forget that fire spreads quickly even after it has just been lit. Do not use any flammable liquids to light your bonfire. Before lightning your bonfire or fireworks it is important that you have followed the simplest of safety measures. Have a bucket of water nearby in case of an emergency, it can also be used to put used fireworks and sparklers in.